An Theeuwes (left) presents the EMEA Chapter Award to graduating student Ilya Meshcheryakov. The twentieth academic year of the Advanced LL.M. Program in International Tax Law at the International Tax Center at Leiden University (the Netherlands) came to a close on August 25, 2018, with a graduation lecture and presentation of awards in the Great Auditorium of the Academy Building. An Theeuwes, past president of the EMEA Chapter, was in the audience for the graduation lecture, “Taxation and Democracy,” presented by Wolfgang Schön, director of the department of business and tax law at the Max Planck Institute for Tax Law and Public Finance, honorary professor at Ludwig Maximilian University of Munich, and vice president of the Deutsche Forschungsgemeinschaft (the German Research Foundation). 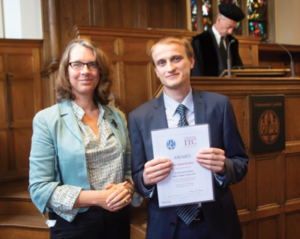 Following the lecture, Theeuwes presented the 2018 TEI EMEA Chapter Award to graduating student Ilya Meshcheryakov of Ukraine. Prior to coming to Leiden, Meshcheryakov earned his bachelor’s and master’s degrees in law at Taras Shevchenko National University of Kiev, where he earned excellent grades and was awarded his diploma with honors. In addition to taking part in moot court and debate club activities, he participated in the university’s pro bono law clinic where he rendered free legal services to some 600 clients. Additionally, he participated in a USAID program, completing a twelve-month internship as a Budget Committee head assistant at the Supreme Council of Ukraine. Following these studies, Meshcheryakov worked for five years at the international law firm of Amond & Smith, providing legal services to Ukrainian individual and corporate clients engaged in business abroad. Meshcheryakov was awarded a Leiden Excellence Scholarship to pursue an advanced LL.M. in international tax law at the ITC—Leiden as a member of the class of 2017–2018. His final paper was a comparability analysis under European Union tax law of outbound cross-border dividends, focusing on discriminatory taxation suffered by nonresident funds with regard to these distributions. Meshcheryakov concluded that each EU country should establish a list of regulatory requirements under which domestic investment funds have the right to be exempt from taxation. Then, if a foreign investment fund operates under equivalent regulation, the foreign investment fund should also be entitled to exemption from taxation, provided that a legal framework enabling exchange of information exists between the country where the distributing company is situated and the country where the investment fund has its registered seat. Meshcheryakov hopes to use the strong theoretical foundation he gained during his year in the ITC—Leiden Advanced LL.M. Program to further pursue a career in international tax law.